Content is often the last thing to be thought about and the first thing to go when looking at budgets for digital. This is obviously mad. Product teams need to incorporate someone who’s in charge of content and how it fits into the overall product. That’s why we’re evolving the way we treat content here at Code and moving towards a ‘content first’ approach. We now have content designers who make sure creating user-focused content is a priority, not an afterthought. We’re finding that clients who incorporate this kind of content creation support in their team are seeing better results faster. Here’s why we think you need a content designer on your product team. You might be used to working with content writers under the more traditional (and broken) model – that’d be ‘user researchers do the research –> designer designs the thing –> copywriter “fills in” the gaps –> launch product’. If you are, it’s perhaps understandable why you might see the role as dispensable. Try working with them in a content design way instead, though, and you’ll soon see the value; done right, their work leads to more satisfied customers and increased revenue. The fundamental difference between a copywriter or content writer and a content designer is that, by definition, content designers are not limited to words. They’re with the project from day one and use data and research to understand what users need, and then create content that reflects their findings. They make sure business needs are met by ensuring content is as relevant and useful to the user as possible. A content designer will get to know your business and your users as much as possible, sitting in on kick-off meetings, attending user research sessions, and working closely with the designer throughout. They wouldn’t be satisfied – or able to do their best work – if they were briefed in on the project when it was already well underway. They wouldn’t be happy to work to a template already created by a designer, and they’d want to continue to iterate content after it’s gone live too. It’s a leaner, more intuitive way of working that’s ultimately worth the investment. "Nothing matters more to your website or digital service than compelling, relevant content." 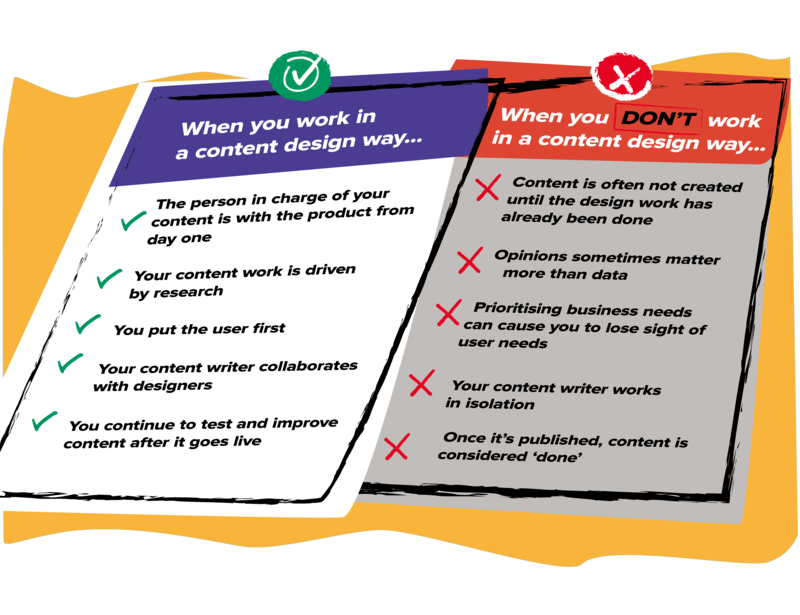 So says Sarah Richards, creator of the Content Design discipline for GDS and author of Content Design. You can have the most beautifully designed website in the world but, if it’s populated with sales-focused, badly written content, your users will leave. Quickly. Yet the task of creating online copy is sometimes handed to in-house copywriters with little to no knowledge of digital, freelance copywriters who are drafted in at the last minute and aren’t embedded in the business or, perhaps worst of all, marketeers more used to writing press releases and social media posts. And this usually happens once the design is already signed off and there’s no room to ask questions or make changes. Is it any wonder that they then struggle to do a good job of it? Having a content designer on your team from the start ensures content is thoroughly researched, accessible and well thought out; that it’s given the attention it deserves. When we create something for our clients, we want to give them the full picture. So asking them to sign off a design filled with gobbledegook or cobbled together copy – with the intent of getting to the actual copy later – won’t cut it. We find that major issues can occur when there’s a disconnect between user research and content creation. When users are presented with a design filled with ‘lorum ipsum’ during testing, how can we expect to get a full picture of how effective the product is? When a copywriter works totally separately from the researcher and the designer, how can we ensure that no insights get lost in translation or missed entirely, meaning the content that comes out the other end of the process isn’t as good as it could have been? When your content designer works with the wider team, learning about your users along the way, there’s no reason that content has to be the last thing that gets done; it can be created at the same time – or even before – the design. This which actually makes things much easier for the designer because they’re no longer having to make educated guesses about how content should be organised, or act as a steer on content when it’s not their area of expertise. This helps you get to the finished product done and in front of the client quicker, and also makes it more likely that your content will work harder. Our whole ethos as an agency is about iterative improvement – our teams work with clients to make the things we build for them even better over time. A product is never ‘done’. So we believe you shouldn’t write your content, whack it on the website and walk away. With a content designer on your team, you’ve got the scope to monitor and improve what you’ve created. It’s the best way to ensure your content keeps pace with changing user needs and continues to be useful and effective.